* One of the World's Most Influential Creationists: With his enormous weekly television audience, David Rives, host of the Creation in the 21st Century on the Trinity Broadcasting Network, is quickly becoming one of the most influential creationists in the world! Bob Enyart is honored to welcome David to the RSR studio. You can watch Rives (for Broncos' fans, that's pronounced Reeves) program every Wednesday at noon Eastern Time. David conducts his own historical and scientific research, has been featured on the History Channel in relation to his work on Dead Sea Scrolls projects, interviews many of the world's most effective creationists, and has appeared on media outlets around the world. 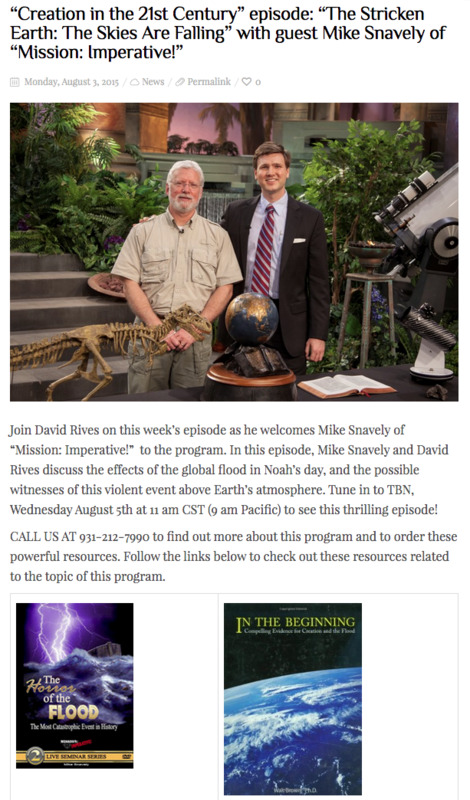 * Two of RSR's Favorite Creationists with David Rives: See David interview Mike Snavely on the global flood and the hydroplate theory (episode just re-aired on August 3, 2015) and Dr. Jonathan Safarti on scientific evidence for the global flood! * RSR/BEL Telethon Update: Thank you to everyone who has given toward our vital $30,000 telethon goal! We're now at $21,000! Please help if you can by clicking here to make a one-time donation, or to browse our store and make a purchase, or by signing up for a monthly donation, or by subscribing to one of our video or audio Bible-based monthly subscription services or by calling us at 1-800-8Enyart (836-9278)! A hermeneutic is a tool for interpreting the Bible that students use to better understand the Scriptures. Proper hermeneutics are invaluable. "Of all Bob Enyart's materials, the Hermeneutics Seminar is the best!" says Brian of Thornton, Colorado. Filmed at Denver's famous Brown Palace Hotel, Bob presents the most important hermeneutics, discusses their misuse, and gives examples of how to use them properly. This fascinating Bible study is available on h MP3-CD or MP3 download. You can click to order online or call us at 1-800-8Enyart (836-9278) and either way you'll also get the extensive seminar handout and the slides that Bob presented to help folks remember each of the hermeneutics and how to use them.